Baby Miller makes his first appearance on screen. He can be seen moving and swallowing - a proud moment for parents-to-be Sian and Brian, and a welcome addition to their baby memorabilia. 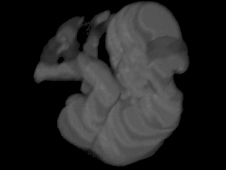 The 3D scan shows that the baby is coming on well, and his development is normal. But the scan is more than just a memento. For the new Miller is one of the latest foetuses to be enrolled in a brain study at London's Hammersmith Hospital, in collaboration with Medical Research Council. Using the scans doctors say they expect better diagnoses of brain disorders, including malformations, growth problems or injuries that can lead to cerebral palsy and sometimes autism. The hospital - part of the Imperial College NHS Trust - is the first in the world to offer the high quality magnetic resonance imaging (MRI). Other hospitals scan their babies using MRI technology, but because patients normally have to keep still for scans it has been notoriously difficult to get good quality scans of the foetus in the womb. Professor Mary Rutherford said her team had got round this by taking multiple scans of the brain and then slotting them together to make a 3D image. "This information will help obstetricians to decide whether a baby is likely to have severe problems with development or whether to deliver a baby sooner as brain growth may be better outside the womb," she said. Professor Rutherford said that all pregnant women at Hammersmith Hospital will be offered the opportunity to take part in the trial as this will enable the researchers to recruit a large number of normal and abnormal brains to study. "Most women enjoy coming and benefit from the expertise and attention throughout their pregnancy," said Professor Rutherford. "What we are trying to do with the foetal MRI is to improve our way of understanding how the foetal brain develops both abnormally and normally so it gives us more information than ultrasound alone. "It is giving us a really powerful tool to look at things in much more depth. "We have been studying the brain in this way for nearly two years but are now also looking at specific problems such as intrauterine growth restriction which has a pretty high morbidity. "This is a real problem in obstetrics. The babies that survive are often born prematurely and may be susceptible to brain injury and gut inflammation. "And even if they escape early problems if you look at them at school they do not function as well as their peers so there is something is effecting their brain development." Professor Rutherford said they would then follow these infants with restricted growth for at least two years but hopefully also into school. She said that by just looking at the brain it is possible to see areas of serious concern - a small cerebellum for instance plays an important role in learning and may be associated with autistic behaviour. 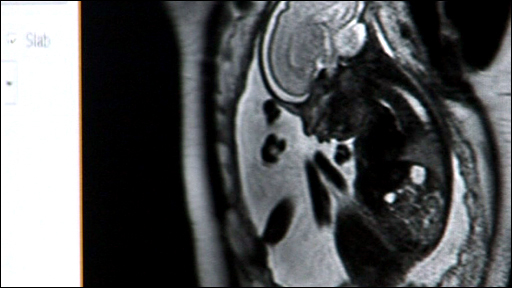 Large ventricles may be associated with learning difficulties. But Professor Rutherford said that for most parents, whose babies have no problems, the scans are a positive experience. "These are absolutely stunning pictures. "We can get copies of a scan for the parent and they particularly love the movie clips. If their baby has died this might be the only visual image they might have to keep." Sian, who has lost six babies in previous pregnancies and has an 18-month-old son, said the scan could be wonderfully reassuring. "We had this scan with our son Gene and we wanted to take part in this new study as well. "Having had all the problems I have had I just wanted to help with research. "I have worried every minute of every pregnancy so this scan, at 27 weeks, has been reassuring. "It was lovely to see him on the scan, I could see him swallowing and moving. Everything in terms of the baby seems to be normal." Husband Brian agreed: "It is a great opportunity to help with the research and having the MRI scan like this is very reassuring." The research has been funded by the Moonbeam Trust and Action Medical Research.